(MoneyWatch) Desktop PCs are an endangered species. Most of us routinely work on laptops, both in the office and out on the road. But just because you work on a laptop doesn't mean you should feel shackled to the built-in trackpad. Recently, my good buddy and former MoneyWatch writer Rick Broida railed against the trackpad in PC World. His words rang true for me, and I felt compelled to spread his message far and wide. Rick observed that wherever he goes -- coffee shops and elsewhere -- he sees many people making do with the trackpad built into their laptops. But trackpads are a device of last resort, sort of like the ejection seat in a jet plane or the "vegetable medley" on a restaurant menu. Trackpads are not ergonomic and -- thanks to the ease with which you can brush the surface and cause unintended edits to a document -- highly accident prone. It doesn't have to be that way. Do yourself a favor and pick up a small and inexpensive travel mouse that you can use wherever you taker your laptop. Rick recommends the Logitech M125, a nice little mouse that can be had for as little as $10. 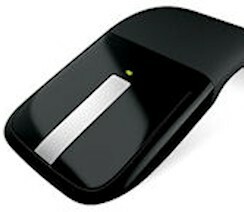 Personally, I like the Microsoft Arc Touch mouse, which I've lauded in the past. It transforms from perfectly flat to a curved, ergonomic device with a snap. No matter what kind of mouse you choose, though, choose something. You'll thank me (and Rick).